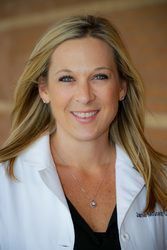 Dr. Jamie McGowan (formerly Dr. Jamie Jinks) enjoys providing comprehensive eye care to patients of all ages, and has spent more than a decade specializing in pediatrics with an emphasis in treating and managing amblyopia and strabismus. In addition, Dr. McGowan is skilled in providing routine examinations, prescribing eyeglasses, contact lens fittings, treatment and management of ocular disease, dry eye management, and co-management of eye surgery/LASIK. Dr. McGowan is a native Kansan, originally from Wichita. She received her Bachelor of Arts degree with Distinction from the University of Kansas, and earned her Doctor of Optometry degree from Southern College of Optometry in Memphis, Tennessee. Following her academic training, she completed several externships with various specialties including amblyopia and strabismus, contact lenses, ocular disease, and low vision. She especially enjoyed the time she spent providing eye care at Tyndall Air Force Base in Panama City, Florida. Before joining the team at Grin Eye Care, Dr. McGowan worked closely with Dr. Trudi Grin in her practice, Pediatric Eye Care, for over 11 years. While there—in addition to developing many great relationships—she expanded and refined her skills, allowing her to provide the absolute best care for her pediatric and adult patients. Dr. McGowan is credentialed by the National Board of Examiners in Optometry, is licensed in Kansas, and is a member of the American Optometric Association and Kansas Optometric Association. Dr. McGowan and her husband Bryan are very proud parents of two young boys, Grayson and Bennett. Outside of spending time with her family, Dr. McGowan enjoys traveling, exercising, catching up with friends, cheering on the KU Jayhawks, and most of all, being a mom.